-Siya Chen- joint curator of Bungalow Colony. A trek to the East-end of Toronto this Saturday afternoon proved a worthwhile venture. Gendai Gallery, located at the Japanese Canadian Cultural Centre is hosting Bungalow Colony, an exhibition by the artist collective “A Collection of Foreign Objects”. The artists present diverse interpretations of the exhibition’s theme “home”. 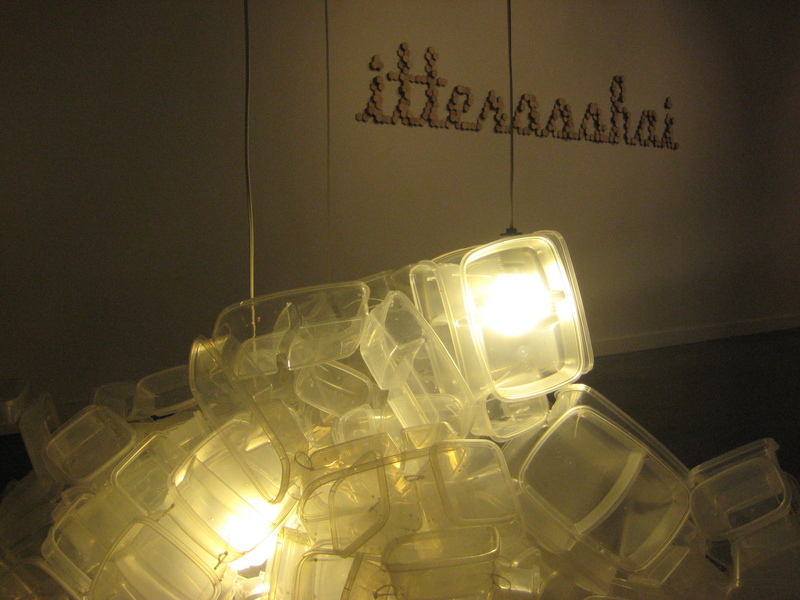 Some highlights of the show include Seema Narula’s installation of empty tupperware containers lit by hanging bare light-bulbs. The light emanating from within the translucent mass of the empty geometries that make up “Leftovers will bring you happiness” immediately call to mind our innate emotional connection to food, but the mass of emptiness seems to be accentuating the stark loneliness of contemporary life. In “I’m going and coming back,” Reiko Shimizu has constructed ordinary Japanese phrases out of tiny hexagonal pieces of plywood. The miniature blocks create a topographic pattern reminiscent of the repetition and conformity of our endlessly repeated everyday actions and phrases. Tom Ngo’s drawings display his typically whimsical and absurd architectural fantasies. These playful sketches are satirically contrasted by the crude pencil lines fashioned by his fanciful mechanical installation, “Keepsake.” Within a small plywood “house” lives a fantastic drawing contraption capable of roughly scribbling the ubiquitous home symbol (sans smoking chimney). Possibly a comment about the obvious lack of creative freedom in the world of mass-produced subdivisions. A Collection of Foreign Objects is made up of Seema Narula, Reiko Shimizu, Steve Newberry, and Aleksandra Rdest. Guest artists in this show are Tom Ngo (LE Gallery) and Myung-Sum Kim. Bungalow Colony runs until August 22, 2010.